Are you outfitting a brand new location or revamping an old facility with new furniture? One of the most important decisions you’ll make is the type of worksurfaces you provide for employees. After seating, this is the office furniture that has the greatest influence on their day-to-day work. And it has an even bigger impact on how efficiently you use the available space. Let’s take a look at the four basic options. Individual desks are the traditional choice because they can be provisioned in so many different configurations. There’s a simple rectangle, an L-shape, a full U-shape, and more. Employees feel a sense of ownership since each desk can be positioned apart from the adjacent workspaces. Built-in under desk storage completes the self-sufficiency of these workstations. They are a good choice for wireless offices that don’t require much cabling or wiring. Cubes offer the same configuration options as desks, but they include greater visual and acoustic privacy. Workstations can be closely adjoined yet still separated by panels, saving floor space without making employees feel too crowded. Overhead bins and vertical rail systems make cubicles the ideal option for offices that need lots of storage space per worker. Runways can conceal wires and cables to power each workstation. Benching is the ultimate space-saving solution with it’s truly tiny footprint. An office workbench is basically one long worksurface with shared structural components (such as legs) from one station to the next. It’s a good choice for teams that collaborate and communicate on a regular basis, but the setup can be distracting for employees who need to focus for extended periods. The central spine on a benching system makes power and cable distribution simple, often saving the most money in this area compared to other options. Worktables are free-standing like desks, but are usually only available in simple rectangular configurations. Today’s hot trend in worktables is height-adjustability. Storage is usually minimal and separate from the worktable. 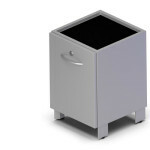 Rolling pedestals are a popular option to pair with worktables. These smaller surfaces may be a good choice for offices that are going paperless. Wall-mounted tables and lounge tables that include seating are other worksurfaces that can be distributed throughout the workplace. 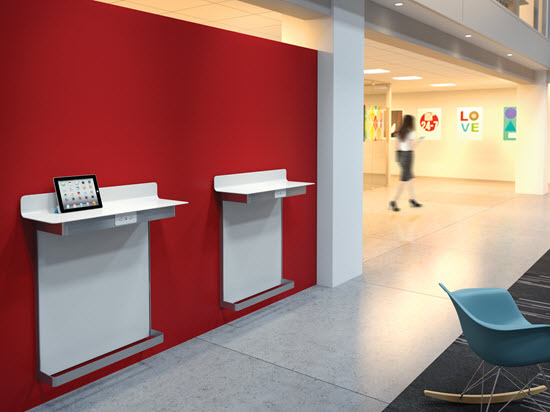 These make great touch down spots for flexible work spaces and for mobile workers. A blog post only has space to scratch the surface of such a big topic! With so many choices, it makes sense to seek expert advice before you buy. Contact The Office Planning Group for an on-site consultation. This post rounds out our month of celebrating the Best of NeoCon 2014. We’ll finish up with a set of workplace benching solutions and storage systems to make the most of available office space. The Telescope from Knoll’s Antenna collection takes benching to the next level buy making it height adjustable. 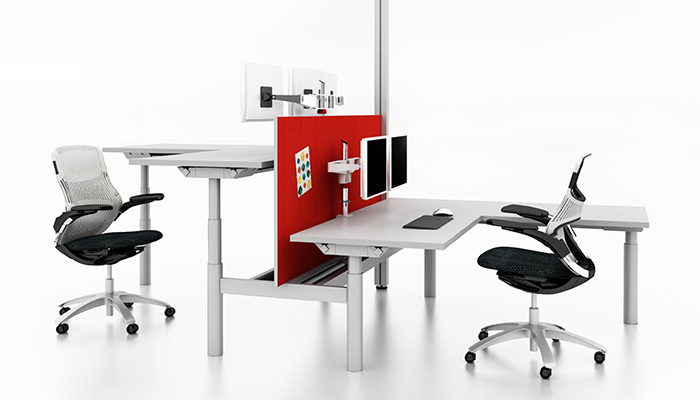 Users can move their own worksurface independently from their coworkers to achieve perfect ergonomic balance. Pneumatic and powered controls are available to make the process easy or very easy. The Telescope sees to it that workers get the full package integrated into their bench space. There are lighting controls, privacy screens, monitor support, wire and power management, and more. The Inscape Bench is designed with workers of all ages in mind. This is yet another sit-to-stand bench solution that fits with the agile workstyle. There’s plenty of cable capacity and lots of power and data access to make sure everyone’s technology stays connected. Spine options make this system readily extensible and the worksurface can be divided with screens or upmounted storage to create a sense of personal space. Secure storage areas can hold devices, CPUs, and personal items to give workers more freedom to move about the office. The Straddle Ped was developed to bring under-desk storage to the new world of height-adjustable worktables. 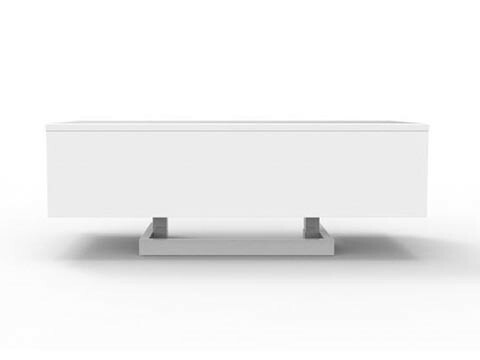 While standard mobile pedestals may not be able to squeeze under a desktop that’s been moved all the way down to its lowest setting, the Straddle Ped can still move with ease. It’s also got a unique rolling frame that’s configured to straddle table legs, making it highly maneuverable. The interior is a nice change from traditional steel as well, with felt padded and felt-lined compartments to lovingly cradle devices and office supplies. That’s it for the Best of NeoCon here at TOPG. To see even more award winning products, visit the photo gallery hosted by Contract. No matter what you find that you simply must have, contact TOPG. We can help you get it for your office! Best of NeoCon 2014: Tables, Tables, Tables! No work environment is complete without the horizontal surfaces that support the work being done. This year’s NeoCon brought to light a number of occasional and work tables in very unusual styles. There’s really something for every company. Davis Furniture—A Match Made in Heaven? 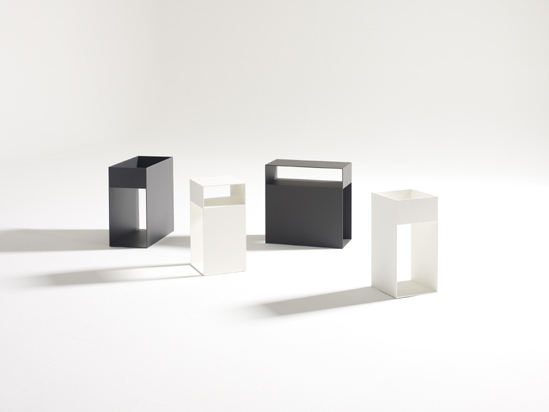 This boxy little beauty called “Match” is like the Mobius strip of side tables. It’s hard to tell which surface is the inside and which is the outside. 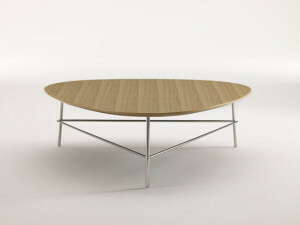 It’s a simple and truly seamless design made of welded steel. Davis Furniture touts this as the puzzle piece that solves your design problems. The polished appearance and sturdy construction make it more than a match for the modern office space. The Triscape table is a favorite this year because of how it fits into the office lounge landscape. The triangular shape cries out for artistic arrangement in concert with clusters of equally inviting Triscape benches. The line between the two types of furniture is blurred with the addition of a tiny, round, padded seat to turn the low table into a miniature workspace. 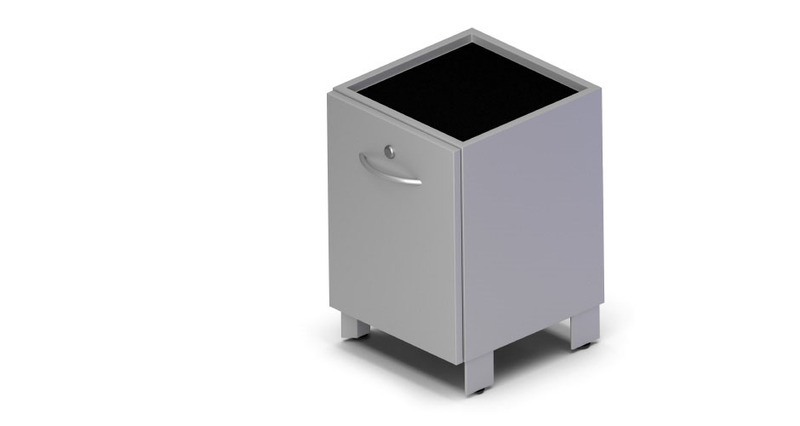 Specify the stainless steel base with attractive laminate, premium oak, or solid surface tops. The charmingly named Peter Pepper Products company wins recognition again with this year’s worktable design. The standing height GoTo Worktable serves as a touchdown spot for short term assignments and multi-taskers. The wall-mounted version is particularly space-friendly, allowing you to make full use of the perimeter of a room. A foot rail can be added if a stool will be provided for seated work, and a wall panel can conceal cabling and wiring. Hooks adorn the table as a place to hang purses or satchels for workers on the go. This piece of furniture was conceived to make a statement in the workplace. It’s the table that marries the technology of a sit-to-stand workstation with the attractive and convenient design of a double-pedestal desk. The worksurface can be set anywhere from 22-48 inches to accommodate workers across a range of heights. The storage travels with the desktop, keeping everything within easy reach with less bending, stooping, and twisting. Perforated modesty panels balance the stature of the desk, and provide a little below-desk privacy for seated and standing workers. Stay tuned next week for more Best of NeoCon surprises! With an event the size of NeoCon, there’s a lot of walking involved. Fortunately, there’s also no shortage of seating when it’s time to take a load off and rest your weary feet. This year, NeoCon featured a wide variety of task seating options for attendees to evaluate during their down time. The judges picked some of the best chairs as award winners. Not surprisingly, the top chairs were designed by some of the most well known companies in the industry. Knoll takes recycling to a new level by constructing a fresh take on task chairs using pre-existing elements. The result is a comfortably familiar chair design with improved performance and flexibility. The Tandem Back is the most notable feature. It blends contrasting materials to create a matrix that offers firm support in the lower back and shoulder regions over a flexible frame that yields to torsional (twisting) movements. The seat is designed to support a variety of movements and postures as well. The upholstery goes all the way to the edge to reduce pressure on the backs of the thighs. The tri-point tilt lock offers users the option to lean back or sit upright, depending on their mood and the task at hand. While Knoll is mimicking its own prior chairs with the Remix, Allsteel is using “Mimeo” to imitate what they imagine the worker of the future will need in terms of task seating. The low back of the Mimeo is designed for the open office, with a profile that won’t interrupt the sense of spaciousness. The breathable back mesh overlaying the “IntelliForm™” back frame won’t block air flow either. This is a chair that’s designed for motion. It can accommodate multi-directional postures and offers weight activated motion. The goal is to adapt to users with minimal adjustment—an important factor in the future workplace where “hotelling” or hot-desking may become even more common. Movement is also the central theme for the MVMT chair from BioFit. 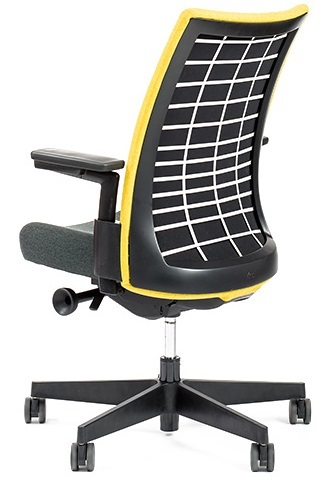 This isn’t a traditional office chair. In fact, it’s designed for a much more demanding environment. This seating is available in clean-room and static control versions for technology, industrial, healthcare, and laboratory uses. Like the Mimeo, the MVMT is weight activated to set the tension, minimizing control resetting from one shift to the next. 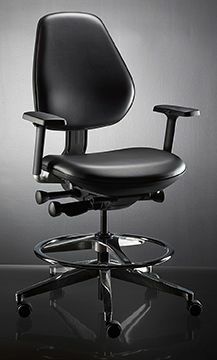 The chair has a forward seat tilt and backrest adjustment for postures used in close-up work such as microscopy and assembly. Stool height versions with footrests are available for environments with standing-height work tables. It’s a new look for the high-tech workplace.